Investors are switching to equity and debt funds to cash in on the stock market rally. Adarsh Shamdasani, 35, general manager at a Mumbai-based export company, invested only in gold and fi xed deposits to build her wealth. She did dabble in equities and debt mutual funds a few years ago, but was quick to retract. "Gold and fi xed deposits have been the safest investment options for me and I have stuck to them," she says. However, of late, Shamdasani has been toying with the idea of making her debut as a 'serious' investor, given the improving macroeconomic conditions and the subsequent rally in the stock market. "With reducing interest rates, equity and debt mutual funds seem to be a more attractive option," she quips. Shamdasani is not alone. An increasing number of Indian investors are trying to make the best of the stock market rally. This is evident from the fl ow of Rs 62,500 crore in equity mutual funds between March 2014 and February 2015. The value of assets held by individual investors in mutual funds increased to Rs 5.52 lakh crore in February 2015 from Rs 3.93 lakh crore in the past one year. Says S. Naren, CIO, ICICI Prudential AMC: "The spur in economic activity and poor performance of other asset classes, such as real estate and gold, in the recent past have contributed to it." 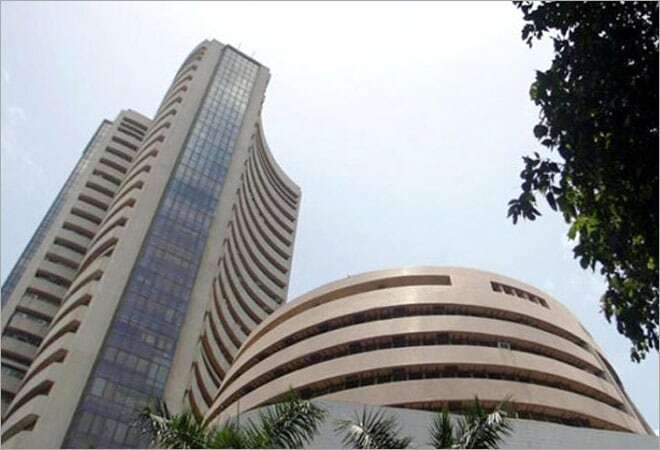 After years of stupor, the Indian stock market rally saw the Bombay Stock Exchange (BSE Index) rise by 27 per cent after the NDA government came to power at the Centre with full majority. 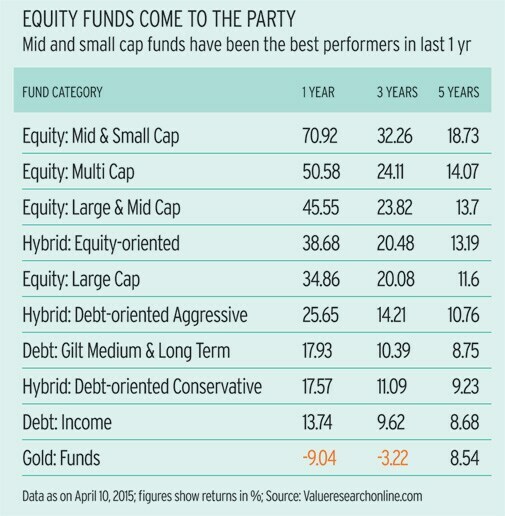 While equity funds have done even better with the category average returns ranging from 35 per cent to 75 per cent, debt mutual funds also gave 25 per cent returns, compared to gold funds losing nine per cent during the period. Naren feels equities will continue to do well. "The government's reforms initiatives have set the stage for a virtuous economic cycle which will boost corporate earnings," he says. Market valuations are a factor of earnings growth, hence current valuations may seem high due to poor earnings growth in the corporate sector. Profi t growth for 2014/15, for instance, collapsed to 4-5 per cent, which is lower than the average of the last four to fi ve years. Even though the stock market is trading at about 17 times one year forward earnings, which may appear expensive prima-facie, given the historical average of 14 to 15 times, in the current scenario, the valuations are not expensive," says Pankaj Pandey, Head of Research, ICICI Direct. During the peak of 2008, markets were trading at 18-20 times one-year forward multiples, leaving enough room for expansion. Going forward, a pickup in earnings growth will depend on the speed with which government reforms are implemented and capital expenditure is undertaken. Naren says the Indian economy is in a much better shape, since current account has been improving, infl ation is on a downtrend, forex reserves are much higher and growth impulses are picking up. The actions taken by the government is likely to start refl ecting in corporate earnings over the next three to four quarters, with a consensus among market experts at 16-20 per cent profi t growth for 2016/17. According to I.V. Subramaniam, Managing Director and Chief Investment Offi cer, Quantum Advisors, investors entering the market now must be wary and invest with a longterm orientation as there is risk of near-term underperformance. "If one does not have the skill set to analyse stocks, avoid direct investments. Instead, use the mutual fund route and do not get carried away by near-term favourites," he adds. Mid-cap funds, for instance, have given over 70 per cent returns in the last one year, which can be attributed to the fact that these funds take incremental risk by investing in high-beta stocks, which allow multi-fold returns. It is diffi cult for large-caps to mimic mid-cap funds. The other factor driving mid- and small-cap stocks is the enhanced liquidity. Typically, liquidity drives mid-cap stocks more easily than large-caps. However, during a bear phase, these stocks fall steeper than large-caps. According to Subramaniam, investors should maintain their core portfolio into large-cap funds, while mid- and small-caps should form a smaller portion of their portfolio. Further, with mid-caps running up twice as much, easy stock picking is behind us. Hence, choosing a fund wisely is more imperative now than before. Investors should look at fund performance through various cycles and its performance vis-a-vis its benchmark. Unlike large-cap funds, which make alpha from sector selection (for example, being overweight on the banking or pharmaceutical sectors, etc. ), mid-cap funds make alpha on the basis of stock selection. Therefore, while choosing a fund it is critical to see who is the fund manager and how his performance has been over the years. Says Vinit Sambre, Fund Manager, DSP BlackRock: "Retail investors should incrementally look at allocating higher share to equities as it is likely to outperform all other asset classes in the next 3-5 years." The other advice will be to follow strict discipline in terms of equity investments and avoid low- quality traps. Investor participation in stock market usually increases as valuations rise, which should not be the case. "It may be prudent to add funds in the balanced, dynamic or asset allocation category as they seek to increase allocation to equity when the markets are cheap, and book profi ts in equities when markets are rising, thereby, reducing volatility and boosting returns," says Naren. Pandey of ICICI Securities is bullish on domestic sectors such as automobiles, cement, capital goods and banks. According to him, defensive sectors such as FMCG, pharma and IT could perform in line with the broader market. He maintains his December 2015 Sensex and Nifty target of 32,500 and 9,750, respectively. Ridham Desai, Managing Director and Head of Research at Morgan Stanley, estimates a 24 per cent CAGR in Sensex earnings in the coming two years compared with 17 per cent estimated by the bottom-up consensus. He is overweight on private sector banks, industrials, discretionary consumption and technology. Naren believes highly leveraged segments are likely to do well considering a 50 basis point cut. It will reduce the interest burden of leveraged companies. Many highly leveraged companies did badly relative to the rest of the market, and some of them are wellpoised to make the most of the lower interest rate cycle. Debt-ridden companies may not necessarily have the best fi nancials or the best balance sheets now and, therefore, it would require intensive research to narrow down to specifi c companies. "Financials is another area that looks quite promising. Public sector banks require capital and, over time, lower interest rates should benefi t banks as it will improve growth and reduce nonperforming assets. A combination of lower interest rates, lower NPAs and capital infusion are extremely positive for the fi nancial sector," adds Naren. Visibility on capex revival through increased government spending and addressing issues of fi nancing infrastructure projects could also benefi t certain sectors in the infrastructure space. Fixed income, too, offers good investment opportunity. According to Pandey, outlook for the bond market turned positive in 2014 on the back of attractive levels of government security (g-sec) yields after continuous sell-off and improving macroeconomic data. The sharp fall in consumer prive index (CPI) infl ation coupled with favourable global and domestic macroenvironment, such as softening global commodity prices, a stable rupee, and comfortable fi scal and current account defi cit, have led to increased expectations from market participants about rate cuts by the Reserve Bank of India. Increased and sustained foreign infl ows in the Indian debt market also improved market sentiments, leading to increased domestic participation in income funds and g-sec funds. What is likely to decide the income trajectory from here on is the CPI or retail infl ation, which is the key driver for interest rates to ease. According to Rahul Goswami, Chief Investment Offi cer, Debt, ICICI Prudential AMC, interest rates are likely to decline by another 50 bps over the course of this year. The 10-year g-sec yield is currently hovering at 7.75 per cent and could fall to seven per cent mark in about a year, making debt attractive. Falling interest rates and yields are good news for bond investors as interest rates and bond prices share an inverse relationship: any fall in rates and yields lead to an appreciation in bond prices, and vice versa. Says Santosh Kamath, Managing Director, Local Asset Management, Fixed Income, Franklin Templeton Investments, India: "Debt mutual funds offer an attractive alternative to traditional savings instruments due to their return potential and tax advantages. Some of the other key benefi ts of mutual funds are professional management, diversifi cation and easy access to liquidity at a fraction of the cost of buying debt instruments individually to build such a portfolio.